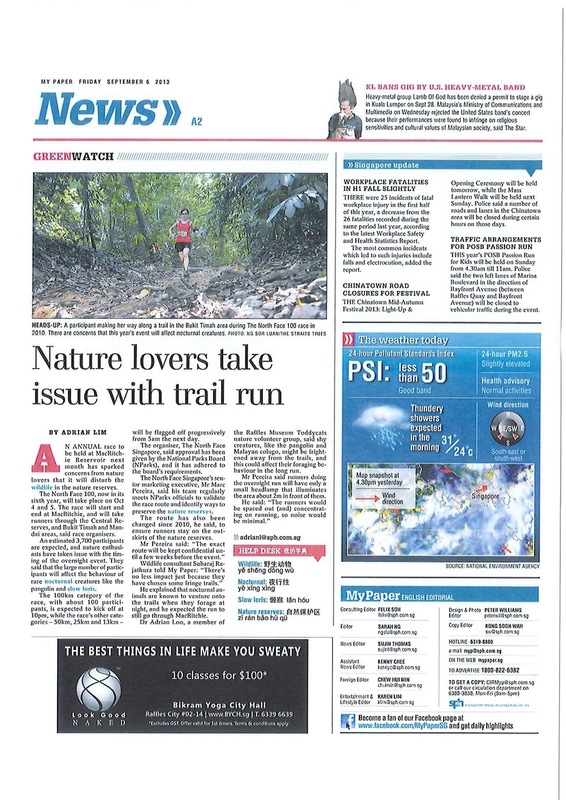 Some people from the Nature Society of Singapore are crying foul over the upcoming The North Face 100km Challenge. This is Singapore's premier trail race held annually in the Central Catchment Area. There are a few categories one of which is the 100km distance which is the subject of NSS' wrath. Apparently, the people from NSS are of the opinion that the runners running through the trails at night will upset the night life in the forest. A similar complain was also made when the race first started in 2009 but despite that the race had continued to be held annually and ironically, grew bigger and bigger with more trail runners taking part. The NSS people seems to suggest that the 100 + or so of runners who will be running through MacRitchie Reservoir and Bukit Timah will scare the hell out of the animals and forced them to run out onto the roads. Frankly I don't know how they came to such a conclusion. I think that will be the last thing trail runners will want to do. Most people who runs in the trails are nature lovers even if they did not start out that way. How to not fall in love with the great nature when in the trails the air is so much fresher, the sound of insects permeates throughout and there are always sighting of beautiful birds, squirrels, snakes and other interesting creatures..
Tn fact, if we want to be picky, the NSS should direct their wrath at the mountain bikers on bicycle or motorcycle and the casual day hiker. I have seen the damages done to the forest by the bikers especially those on the motor bikes at Tampines Mountain Bike trail and Tampines Quarry. They go all over the forest carving out new trails and in the process killing the plants and running over snakes. The casual hikers comes in big group, some blasting their music so loudly that whatever animals will all be driven away. And worse, they will pluck plants and trample all over the place to get a closer look at them. Then there are the nature photographers. Many time during my runs, I have seen them plucking leaves presumably with an insect or caterpillar on it and securing it to a clamp and photographing it away from the element. If that is not displacement, I don't know what is. Another group of people that the NSS should be going after are the bird photographers. I have heard and read on photography forums of how they go so near to nests that the mother bird flew away and abandon the nest or the chicks are removed from the nest so that they the photographers can take a close up pictures. So does that mean that we ban everybody from the forest and only the people from the NSS has the rights to go into the forest? If anything, I think the NSS should work hand in hand with all the other interest groups to cultivate respect for nature and share whatever remaining green that we have on this little island. Maybe then, the collective voice will be much louder and strong enough to be heard and influential enough to get a rethink on the proposed MRT line through the Central Catchment area and the development of Bukit Brown. Otherwise if NSS conttinues with it hard nose stand against all other user of the great reserve, the only loser will the nature that they seek so hard to protect. I find it ironic that NSS are complaining about the TNF 100. Didn't they support the Green Corridor Run? Oh I forget, they were the 'Official Charity Partner' for that run and during the registration process, participants were 'encouraged' to donate to NSS. As a matter of principle, if they oppose to TNF, they should not have supported the GCR. Let see what happened next yr. Maybe TNF should just make NSS their 'Official Charity Partner' too. That may cut down all the noise.